Coconut brittle is a rich, toasty brittle recipe with loads of flavor from shredded coconut. If you thought brittles had to include peanuts or other nuts, you must try this coconut variation. It’s wonderful dipped in chocolate, eaten plain, or crushed and used on top of coconut cream pie or other desserts. Prepare a baking sheet by lining it with aluminum foil and spraying the foil with nonstick cooking spray. Set aside for now. In a medium saucepan, combine the water, corn syrup, sugar, butter, and salt over medium-high heat. Stir until the sugar and butter dissolve, then insert a candy thermometer. Cook the candy without stirring until it reaches 240 F (115 C) on the thermometer. Once at 240 F, add the unsweetened coconut and stir it into the candy. Once the coconut is added, you will need to be very vigilant and stir the candy frequently to prevent it from burning. It will be thicker and more difficult to stir and might clump around the thermometer. 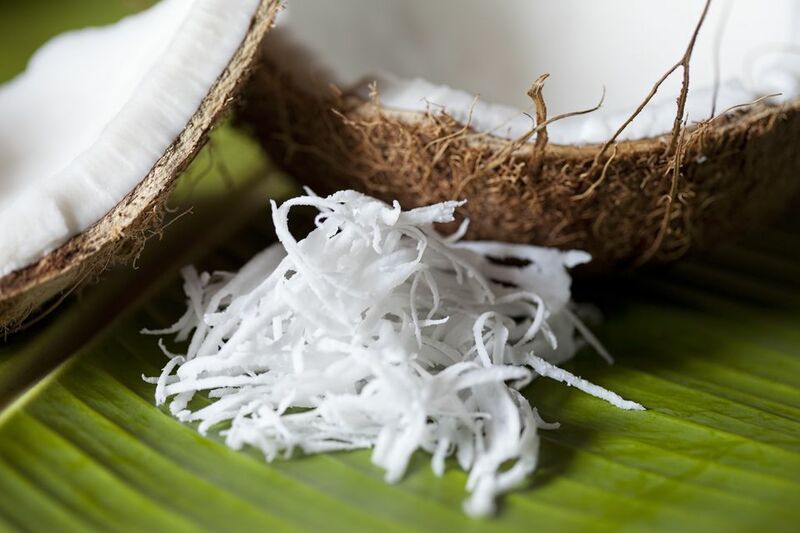 The coconut will start to darken and the whole candy will get browner and have a toasty aroma, but with frequent stirring, it should not blacken or burn. Cook the candy until it reads 290 F (143 C) on the candy thermometer. Once at 290 F, remove the pan from the heat immediately and stir in the vanilla extract and baking soda. As the baking soda is added the candy will start to loosen up and foam up. Pour the candy onto the foil-lined baking sheet and use an offset spatula to spread it into a very, very thin layer. This candy is better the thinner it is, so try to get it as thin as possible. Once it has started to set but is still flexible, carefully use your hands to pull it thinner, as you would stretch peanut brittle. Allow the coconut brittle to cool completely. Once cool, break it into small chunks. If you want, you can smear chocolate on the brittle before breaking it, or dip individual pieces in chocolate. Coconut brittle can be kept in an airtight container at room temperature for up to two weeks.